Salmon river season is upon us with the recent rains and the saltwater salmon fishing is still going strong! This is your chance to get geared up for the upcoming season and restock your favourite flies and lures that have been producing all summer. Great gear is on sale at amazing prices! Come down and take advantage of serious savings throughout the entire store. See something in the store that is not on this list? No problem, the time to ask for a deal is this weekend because we are ready to help you save, save, save! From expert to beginner, we have something for you at the best prices of the year. So come down for some friendly advice, get geared up, and save money! There are great deals on all your favorite brands like Simms, Sage, Hardy, Redington, Rio, Scientific Anglers, OPST, 3 TAND, Abel, Fenwick, Shimano, G. Loomis, Abu Garcia, Okuma, Outcast, Rapala, Trophy, Daiwa, Islander, Amundson, Penn, Milner, Mitchell, Flambeau, Gibbs Delta, Oki, Gamakatsu, Mustad, Owner, Luhr Jensen, Mad River, Worden’s, Berkley, Maxima, Seaguar and many, many, more! Minimum 10% OFF on all in stock items in our Saltwater Section, Freshwater Section, Fly Fishing Section, Fly Tying Materials, Flies, Sunglasses, Waders, Boots, Jackets, and so much more! There will be discounts going up to 50% OFF on selected items! We are clearing out some sections to make room for new 2019 product and that means some new stock for the 50% off bins! Selected Rio, Scientific Angler, and Airflo fly lines up to 50% OFF! 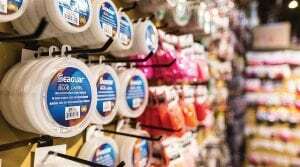 Selected Fly Tying Materials 50% OFF! Saltwater Tackle Value Bin 50% OFF! Freshwater Tackle Value Bin 50% OFF! Build your dream combo for fly fishing, saltwater fishing, freshwater fishing, 15% OFF! Purchase a float tube, fins and waders and receive 15% OFF! Purchase a float tube & fins and receive 10% OFF! Note: Combo discounts can’t be added to items already on sale or discounted. We have all the right gear on sale for river fishing and lake fishing from the best brands like Fenwick, Okuma, Shimano, Rapala, Trophy, Shakespeare, Daiwa, Mitchell, Ugly Stik, Plano, Flambeau, Gamakatsu, Normark, Gibbs Delta, Owner, Luhr Jensen, Mad River, Worden’s, Berkley, Maxima, Seaguar, just to name a few! All Freshwater Terminal Tackle & Lures 15% OFF! Cuda Pliers, Cutters, Knives 15% OFF! All VMC, Gamakatsu, Owner, Mustad, Eagle Claw hooks 15% OFF! Includes small packs and bulk packs! Stock up now! Rods by Rapala, Shimano, Trophy, Daiwa, Fenwick, Ugly Stik, Okuma 15% OFF! Rapala Classic Float Rod, 11 footer, medium action, perfect for coho and steelhead. This rod is regular $259.95 on sale at 40% off for $155.99 while supplies last! G. Loomis float fishing rods and spinning rods 10% OFF! Islander 10% OFF! Milner 10% OFF! Raven 10% OFF! Okuma 15% OFF! Rapala 15% OFF! Okuma Spinning Reels for trout and salmon 20% OFF! Penn Spinning Reels for trout, salmon and blue water 15% OFF! Daiwa Spinning Reels for trout, salmon and blue water 15% OFF! Abu, Daiwa, Shimano, Okuma level wind reels for salmon and steelhead 10% OFF! Luhr Jensen Gooey Bobs & Egg Clusters 50% off while supplies last! Mad River Steelhead Worms 15% OFF! Flambeau Tackle Boxes 20% OFF! Gibbs Koho & Croc Spoons 15% OFF! Blue Fox Vibrax Spinners 20% OFF! Pro Cure bait cures and scents 15% OFF! We are Vancouver’s saltwater fishing experts! Our guide boats are constantly on the water and we know what works for local salmon! 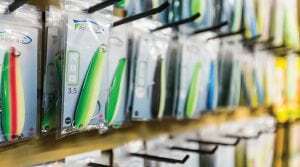 Come in for a great selection of saltwater tackle from brand names like Oki’ Tackle, Gibbs Delta, Rapala, Shimano, Daiwa, Abel, Islander, Amundson, Fenwick, Flambeau, Scotty, Silver Horde, Yamashita, Sea King, Trophy, Pesca, Coleman, Victorinox, P-Line, Luhr Jensen, Rhys Davis, Tomic, and many more! Select Rhys Davis Teaser heads 30% OFF! Some great UV and Glow colours! Select Oki & Gibbs Flashers 30% OFF! Some great UV and Glow colours! Select Yamashita Hootchies in 5 packs and pre-tied 30% OFF! Get geared up for the fall weather with Simms, Mustang, and Helly Hansen, 10% OFF! All Mustang Inflatable Collars on sale, too many too styles to list! All Saltwater Terminal Tackle 15% OFF! All Crabbing & Prawning Gear 15% OFF! Cannonballs, from 5 LB to 20 LB, 10% OFF! Rods by Rapala, Shimano, Trophy, Okuma, Daiwa, Fenwick, Ugly Stik, 15% OFF! Mooching reels by Shimano & Daiwa, 10% OFF! Amundson mooching reels 10% OFF! Abel & Islander mooching reels, 10% OFF! Shimano Tackle Bags & Tackle Backpacks, 15% OFF! Bulk Teaser Heads, 15% OFF! G-Force, Skinny G, Pesca, Coyote, Kingfisher spoons 15% OFF, huge selection! Penn reels for bottom fish, halibut, sturgeon, 15% OFF! Shimano reels for bottom fish, halibut, sturgeon, 10% OFF! Shimano Evair Deck Boots, a guide favorite, 15% OFF! 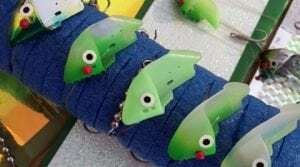 The fall chinook are coming! Get your anchovies and herring now at 15% OFF! Coleman 5 QT bait coolers, 15% OFF! Flambeau tackle boxes 15% OFF! Victorinox & Rapala cleaning and fillet knives 15% OFF! Fall is here and that means fly fishing lakes for big trout! 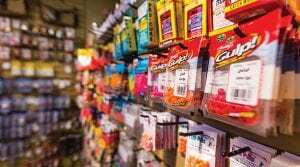 This is your chance to save big on the industries top brands like Sage, Redington, Rio, Simms, 3-TAND, Hardy, Waterworks Lamson, Abel, Renzetti, Regal, Dr. Slick, Wapsi, Hareline, and on our huge selection of flies and fly tying materials! 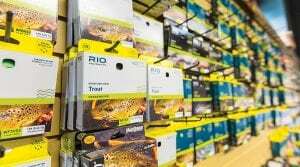 Selected Rio, Scientific Anglers, and Airflo fly lines up to 50% OFF! Sage 4650 Spool, colour Storm, reg. $235.00 now 50% OFF! Sage Method 6119-4 Switch Rod, reg. $1,250.00 now 40% OFF! This 11’9” 6 weight switch is a lightweight fast action rod that has just the right amount of backbone. It’s perfect for summer steelhead and coho on small to medium size rivers. It would also be a great dedicated Scandi dry fly stick. Check out what the experts at Deneki Outdoors have to say about the Method Switch 6119-4 1 only, first come first serve! Redington Dually Spey & Switch Rods reg. $350.00 now 30% OFF! Redington Surge Fly Reel 10/11/12 weight, reg. $139.95 now 30% OFF! 3 TAND Fly Reels, fully machined fly reels with sealed drags! T100 Reel 9-11 WT reg. $610.00 now 30% OFF! T70 Reel 7-9 WT reg. $475.00 now 30% OFF! T70 Spool 7-9 WT reg. $170.00 now 30% OFF! T50 Reel 6-8 WT reg. $405.00 now 30% OFF! TF40 Reel 3-5 WT reg. $260.00 now 30% OFF! TF50 Spool 4-6 WTS reg. $160.00 now 30% OFF! All Fly Tying Materials, Vises & Tools 15% OFF! All Fly Lines 15% OFF! All Fly Fishing Nets 15% OFF! All Fly Boxes 15% OFF! All Leaders & Tippet 10% OFF! Outcast Float Tubes, Fins, Pumps, & Accessories, 10% OFF! 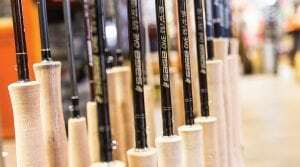 Sage Rods & Reels 10% OFF! Orvis Fly Rods 10% OFF! TFO Fly Rods 10% OFF! G.Loomis Fly Rods 10% OFF! Redington Rods & Reels 10% OFF! We have a huge selection of layering pieces, waders, boots, jackets, vests, chest packs, backpacks, hip packs, dry bags, hats and gloves, to keep you fishing in comfort while chasing salmon, trout, steelhead and sturgeon this fall and winter! Heading south this winter to chase bonefish, permit and tarpon? We have lots of technical pieces in stock to keep you cool and protect your from the sun while making those long bomb casts into the wind! 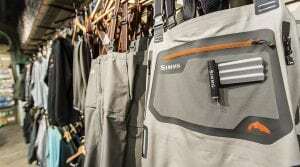 Come down and check out our selection of Simms, Fishpond, Orvis and Howler. All Layering Pieces – Fleece Pants – Fleece Tops – Wicking Layers, 15% OFF! Fishpond Bags, Packs, and Vests 10% OFF! Orvis Bags and Packs 10% OFF! Simms Chest Packs, Hip Packs, Backpacks, Dry Bags 10% OFF! 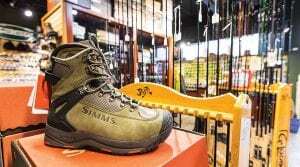 Simms Waders, Wading Boots, Flats Boots, and Deck Boots 10% OFF! Simms Shirts & Hats 10% OFF! SUPER SIMMS DEALS AT 40% OFF! Here is a list of some great savings on Simms product that have been discontinued or there has been a colour change. This is your chance to pick up top-notch gear at price reductions that don’t come along very often! Select T-Shirts and Technical Shirts, reg. $39.95-$79.95 40% OFF! Fall Run Jacket, S, M, L, XL in Black, Hickory, Loden, reg. $229.95 40% OFF! Rivershed Sweater Full Zip, M, in Loden or Black, reg. $149.95 40% OFF! Guide Jacket M, L, XL, in Loden or Iron, reg. $399.95 40% OFF! Pro Dry Jacket, M, in Fury Orange, reg. $649.95 40% OFF! Contender Bib Pants, XL, in Dark Gunmetal, reg. $414.95 40% OFF! Challenger Bib Pants, M, L, in Hex Camo Boulder, reg. $269.95 40% OFF! Rogue Fleece Hoody, M, L, in Hickory and Nightfall, reg. $99.95 40% OFF! Montana TechWool Zip Top, M, L, XL, reg. $189.95 40% OFF! Skeena Glove M, L, reg. $54.95 40% OFF! Guide Mid Pant S, M, L, XL in Black, reg. $109.95 40% OFF! Guide Mid Top S, M, XXL in Boulder and Black, reg. $119.95 40% OFF! We have a great selection of polarized sunglasses from Maui Jim, Smith, Zeal, and Suncloud to keep your eyes protected on the lakes, rivers, and flats. We have the popular “reader” sunglasses that have magnification on the bottom of the lens. Perfect for tying knots with hard to see fishing line! 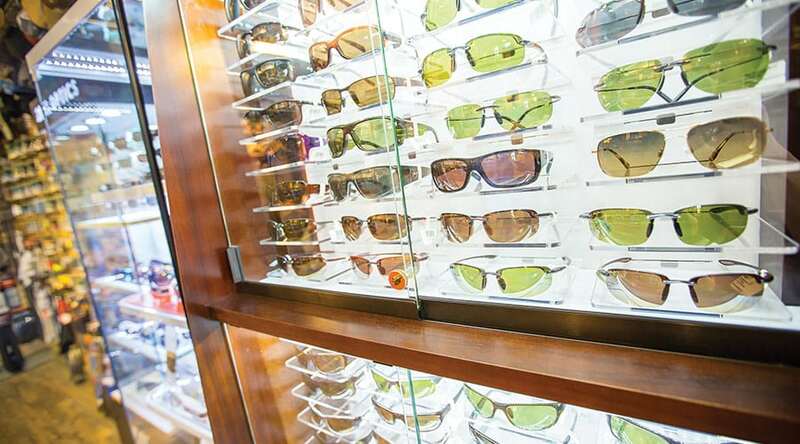 Maui Jim & Smith Sunglasses 10% OFF! All sales on September 15th & 16th , 2018 are final and are not eligible for refund or exchange. We accept Cash, Debit, Visa, MasterCard, American Express and Pacific Angler Gift Cards. Sale prices are for in stock items only and do not include applicable taxes or shipping.